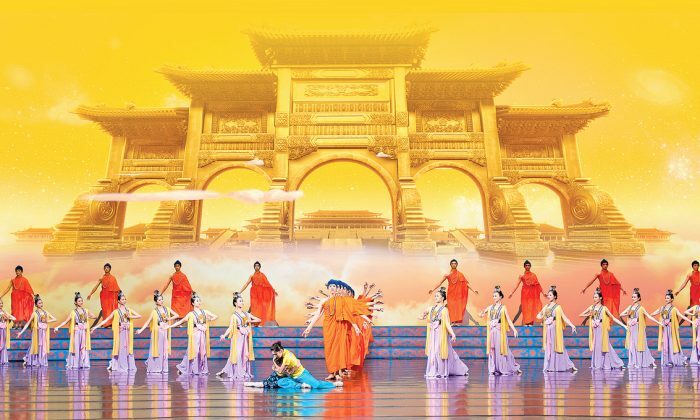 Shen Yun Performing Arts, the premier classical Chinese dance company, was set to perform in Thailand for the first time in January. The theater was booked months in advance. Tickets were selling at a brisk pace. But in the days leading up to the opening night on Jan. 11, Bangkok’s Aksra Theatre suddenly declined to host the New York-based dance company. The promoters couldn’t secure another first-rate venue on short notice, and Shen Yun was forced to skip Thailand for its 2017 season. The theater’s withdrawal, it appears, was likely the result of pressure from the Chinese regime. The Epoch Times recently obtained a letter sent by the Chinese Embassy in Thailand to the Thai Ministry of Foreign Affairs, copied to the police and the Ministry of Culture, that calls on the Thai government to ban Shen Yun or else risk rocky diplomatic ties with the Chinese regime. “In order to avoid affecting the well-developed relationship between China and Thailand, the ministry is kindly requested to pay close attention to the issue and timely coordinate with relevant authorities to ban” Shen Yun and the spiritual discipline Falun Gong, read the letter, which is affixed with an official-looking red seal and dated Dec. 23, 2016. Shen Yun was scheduled to perform in Thailand from Jan. 11 to Jan. 15. Shen Yun was founded by practitioners of Falun Gong, a traditional Chinese spiritual practice that has been brutally suppressed by the Chinese regime since 1999. Shen Yun’s performances also feature vignettes that depict the regime’s persecution of practitioners. 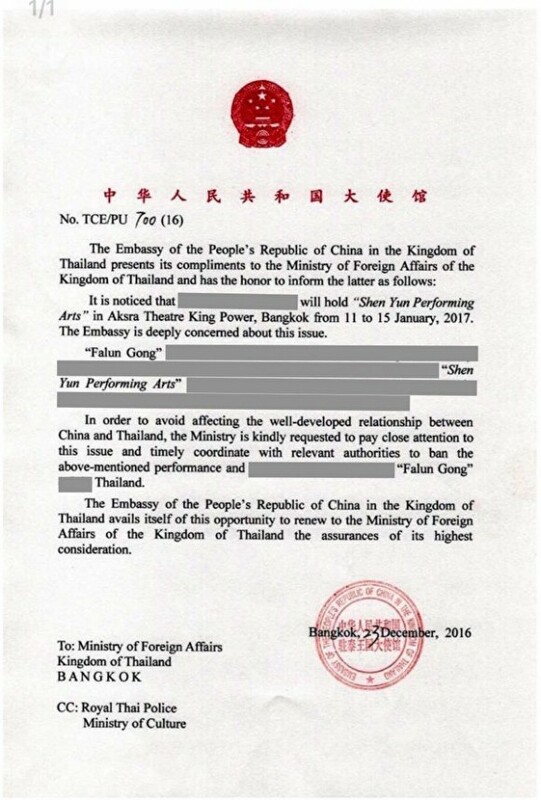 The Epoch Times received a version of the letter that had the Chinese regime’s slander of Falun Gong redacted; local promoters of Shen Yun in Thailand appear to have obtained the original letter from their contacts in the government. “But the Chinese communist regime exerted immense pressure on the Thai government. The Chinese Embassy interfered unreasonably, and this behavior should be condemned by the international community,” she said. The Chinese regime has sought to sabotage Shen Yun since the company’s inception in 2006, as documented by Leeshai Lemish, an emcee with Shen Yun, who keeps a running list of anti-Shen Yun activities engaged in by individuals suspected of association with the Chinese authorities. These activities include making threatening calls to theaters, slashing Shen Yun’s tour bus tires, sending letters to local politicians warning them about Shen Yun, and more. Western media have also been roped into doing the Chinese regime’s anti-Shen Yun work. This January, several Western publications carried a paid advertisement by the state-run China Daily that featured slanderous propaganda about Shen Yun. Few of the regime’s tactics of subversion appear to bear fruit. In past cases, local politicians, wondering what the fuss is about and sometimes indignant at being told what to do by a foreign government, ended up attending and appreciating Shen Yun shows. Concertgoers around the world, many accomplished producers, musicians, and dancers themselves, often praise the company after seeing it. Some theaters and governments, however, eventually cave in under the intense pressure from the Chinese regime. The most recent high-profile incident was in South Korea, where a district court ruled in May 2016 that Shen Yun couldn’t perform in the state-owned KBS Hall. The regime’s motivations for subversion appear to be two-fold. First, Shen Yun seeks to revive China’s 5,000-year-old, divinely inspired culture through music and dance, according to its official website. The Chinese regime, despite being responsible for destroying much of Chinese culture, considers itself the sole custodian to all things Chinese. Second, given Shen Yun’s association with Falun Gong, targeting the dance company is in line with the regime’s persecution policy against the spiritual discipline.